87 Foot Pounds of Torque. This is a big bike… It’s a heavy bike. But it really doesn’t feel big or heavy once your in the saddle. Unless you are short legged… then it’s going to feel pretty tall. The Enduro version is even taller by a couple inches. The Multistrada though, is more than just a butch superbike… Thanks to the DTC and Skyhook technologies (Traction Control and Active Suspension) the Multistrada becomes a very road-worthy bike that can devour the miles on pretty much any road surface you would care to travel on… and even when there is little to no roads. You could easily take it on long trips . The bike shown in the photos is a used bike that I borrowed to check out. 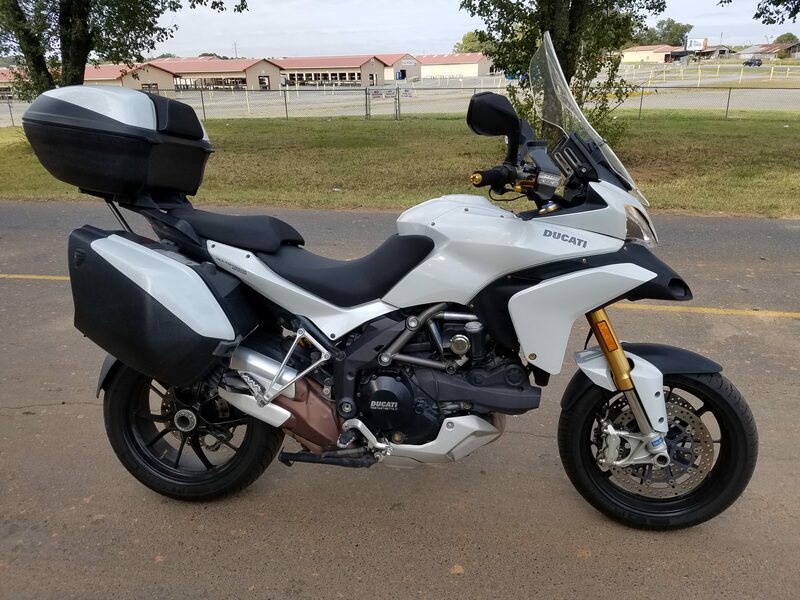 It’s sporting factory hard cases, and an aftermarket windshield, which sets this bike up nicely for some serious distance touring. 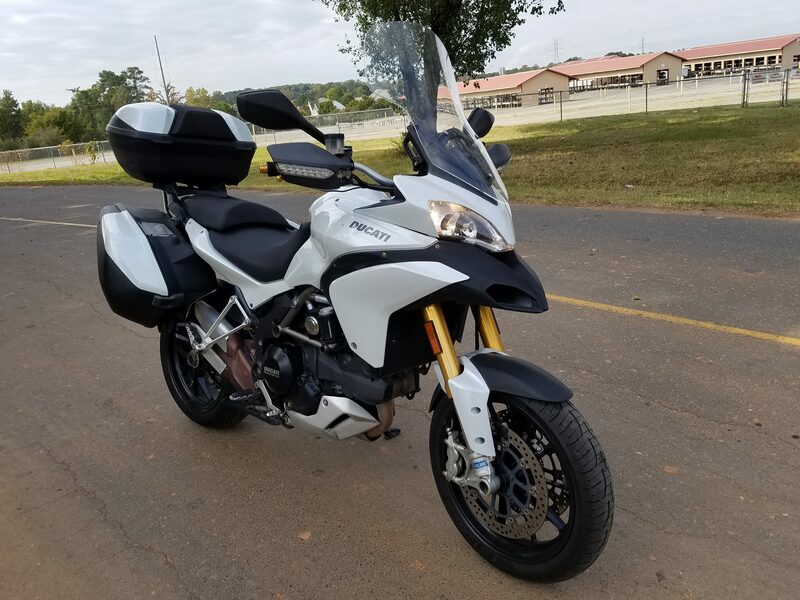 The Multistrada is very comfortable, and after an hour in the saddle, I really felt like I just wanted to keep going. Pitching the Multistrada into the curves is pure joy. The bike is flickable like a Switch Blade. It really thinks it’s a sport bike. Cutting the apex and gassing it, you can feel the bike wants to play. The Engine is what makes this bike rather special… Typical full bore Ducati Twin feeling, it’s happiest when you are keeping the RPMs above 5000. My first impression on this bike was that it was “Naughty”. It wanted to misbehave. It didn’t like to be lugged… it didn’t like to go slow… It wanted to RUN! It wanted to buck like an excited wild horse. It would lift the front wheel on a whim, and would exceed the posted speed limits at moments notice if I didn’t keep it in check! In short – This is a FUN motorcycle that you could spend a lot of time on. I can’t speak to the offroad prowess… As I didn’t take it over anything more challenging than some damp leaves on the ground… But the Multistrada 1200S isn’t really meant for Off Road. There’s another version for that. The Multistrada Enduro… But dirt roads wouldn’t be a problem at all for the 1200S, thanks to the onboard avionics. 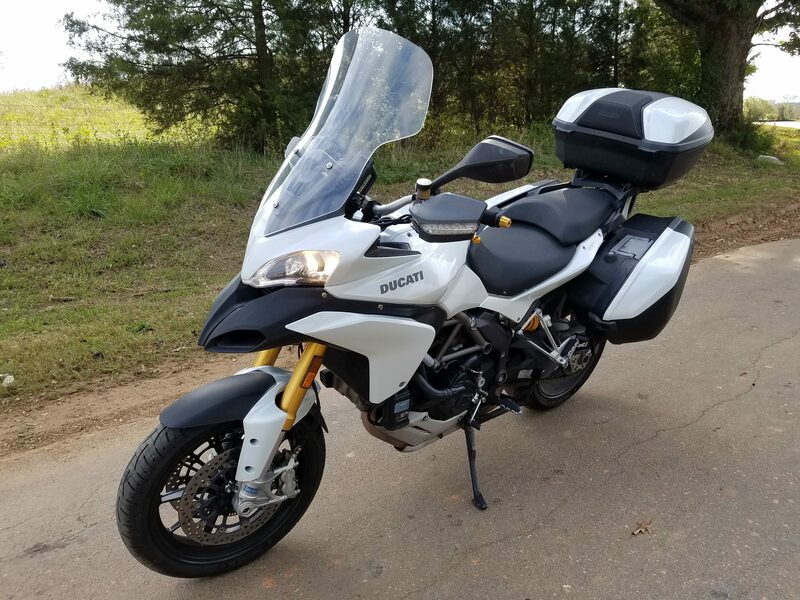 The bike is filled with tech… gyros that measure Pitch and Yaw and bank, as well as throttle position and tire slip… it’s basically the flight control systems out of an F-16. The computers take all that information and adjusts the suspension and the power to the wheels and brakes to keep you on two wheels…. at pretty much any speed. And all done seamlessly and transparently. It makes you feel like a much better rider. It gives you confidence. It urges you to ride a little harder… It’s a naughty bike for sure! If you think Adventure Bikes are boring… Friend… You need to try a Multistrada.